Thurman Bogle peddles his produce. Cannon County Farmer’s Market has a wide selection of local favorites, items that you can find this coming Saturday: cucumbers, eggplants, handmade crafts, herbs (Cilantro, sweet basil, oregano), okra, onions, peas (purple hull, speckle field peas, Dixie peas), peppers (sweet banana and Jalapeno, Anaheim and Cheyenne, habanero, poblano & green), potatoes, squash (patty pan/acorn, zucchini, yellow & miscellaneous squash), sweet corn (weather permitting), tomatoes (green, yellow and vine ripe and roma), and a great selection baked goods, jams and jellies. The Cannon County Farmers Market is located at the Cannon County Arts Center every Saturday beginning at 6 a.m.The Market has a vast selection of locally grown fruits and vegetables along with baked goods, crafts and jams and jellies. Our producers are proud to offer locally grown farm fresh produce. 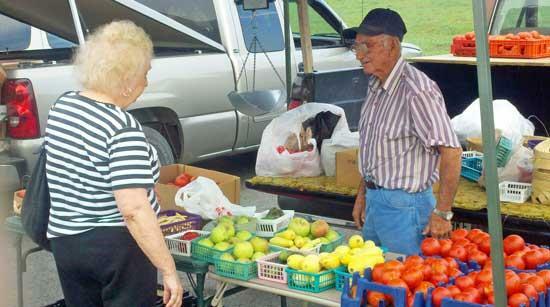 Visit the Cannon County Farmers Market at http://www.cannoncountyfarmersmarket.com/ for the latest on market news. You will also find useful information on recipes, food preservation, production tips and much more. Most Saturdays the market is open until noon or until the farm fresh fruits and vegetables have been sold. Best way to get the best selection is to come early! If you need more information concerning the Cannon County Farmers Market, contact Bruce Steelman at the Cannon County Extension Office (563-2554). The Cannon County Extension Office is planning a “canning” demonstration on September 10. If you need information on canning or freezing contact Carla Bush at the Cannon County Extension office at 563-2554.Information can also be found at the Market’s website at http://www.cannoncountyfarmersmarket. Featured vegetable of the week; the tomato belongs to the nightshade family and is native to South America. The origin traces back to Peru and Mexico. No one really knows when the tomato was domesticated. It is believed that the first domesticated tomato may have been a small yellow fruit (cherry tomato), grown by the Aztecs in Central Mexico. Like other plants in the nightshade family, tomato leaves and stems contain alkaloids that are toxic if ingested. Officially, the tomato is classified as a fruit. “This argument has had legal implications in the United States. In 1887, U.S. tariff laws that imposed a duty on vegetables, but not on fruits, caused the tomato's status to become a matter of legal importance. The tomato is one of the most popular items in the home garden. The success or failure of one’s garden is often dependent on the success of the treasured vine ripe tomato. Bragging rights are often heard from the first to pick the first vine ripe tomato. Tomatoes are available in many sizes, shapes and colors. If you’re a tomato enthusiast, you have your favorite variety, including those that have been past down from generation to generation. Very few fruits and/or vegetables are more widely used than the tomato. What a great trivia question, favorite tomato use as an ingredient; soups, ketchup, salads, raw, paste, stuffed, etc. If you are looking for canning tomatoes or just some to eat in your favorite way, the Cannon County Farmer’s Market has a great selection. For more information, contact the Cannon County Extension Office at 563-2554.